The 21st Century has brought with it a narcissistic epidemic, and a flood of traumatised victims that end up in the therapy room. At Last A Book That Delves Into The World Of The Narcissist And Looks At The 3 Faces They Possess. 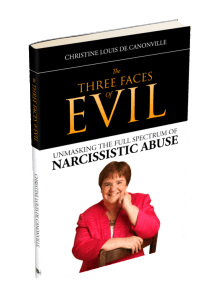 The Three Faces of Evil - Unmasking The Full Spectrum Of Narcissistic Abuse is not only a primer for therapists, but is written for everybody, especially those survivors wanting to understand what happened to them while in a relationship with a narcissist. This book will educate and familiarize the reader about the complexity of narcissistic behaviours, giving a basic understanding of The Dark Triad: from Narcissistic Personality Disorder, Malignant Narcissism, to the most pathological.....the psychopath. "This is a book that will really help you understand a narcissists mind."